Shellfish larvae including those of clams, scallops, oysters, crabs and lobster often settle into eelgrass meadows due to the dampening affect that eelgrass has on water movement (tidal currents and waves). These animals often take residence in eelgrass perminently because of the protection that eelgrass provides. Eelgrass stabilizes the sea floor with its roots and rhizomes , not only protecting burrowing shellfish from washing away but also concealing them from predators, increasing their chances of surviving to adulthood. Once large enough, these shellfish become difficult for a predator to consume. 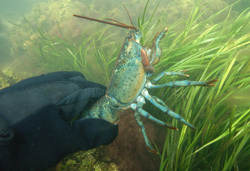 Crustaceans such as the blue claw crab actively hunt for prey in eelgrass, while adolescent lobsters burrow under eelgrass rhizomes for protection and have been known to overwinter in these habitats. 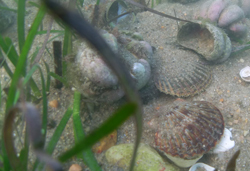 Filter-feeding bivalves such as clams and scallops also benefit from living in eelgrass due to the increased amount of particulate food which is settled out of the water column by eelgrass blades (Peterson et al. 1984). This allows the shellfish to grow faster, reaching a size where they are less vulnerable to predation at a faster rate. Adult shellfish are also protected by eelgrass from above-water predators, such as sea gulls and osprey, which have a hard time pinpointing their prey within an eelgrass meadow as opposed to one on a sandy bottom. The highest densities of bivalves have been found along the edges of seagrass beds, likely because the increased food availability here leads to increased growth rates (Bologna and Heck, 1999). Peterson et al. (2001) found no significant difference in predation pressure between the edge and center of eelgrass beds, but found both of these had significantly less predation than non-vegetated habitats. Learn more about Bay Scallops and Fisheries. Bologna PAX and Heck KL. 1999. 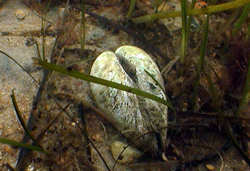 Differential predation and growth rates of bay scallops within a seagrass habitat. J Exp Mar Biol Ecol 239: 299-314. Heck KL, Hays CG and Orth RJ. 2003. A critical evaluation of the nursery role hypothesis for seagrass meadows. Mar Ecol Prog Ser 253: 123-136. Peterson BJ, Thompson KR, Cowan JH and Heck KL. 2001. Comparison of predation pressure in temperate and subtropical seagrass habitats based on chronographic tethering. Mar Ecol Prog Ser 224: 77-85. Short FT, Matso K, Hoven HM, Whitten J, Burdick DM and Short CA. 2001. Lobster Use of Eelgrass Habitat in the Piscataqua River on the New Hampshire/Maine Border, USA. Estuaries 24(2):277-284.